1. For the PDF generated (FP00001_verrypdf.pdf) by spl2pdf_cmd, when I use vc++test.exe to OCR it as text output, could not get the needed info. 2. I also used the arcrobat pdf virtual printer tool, for the same print job, it can output a PDF (FP00001_virtual.pdf), and use vc++test.exe to OCR it, could get quite accurate result. I will attach all the related files later. FP00001_verrypdf.pdf is a PDF file which contain image data only. FP00001_virtual.pdf is a PDF file which contain text contents. FP00001.SPL is an EMF-SPL file which contain image data only. If you wish to create the FP00001_virtual.pdf file, you need modify the options in your virtual printer in order to create a text based FP00001.SPL file, then you will able to create FP00001_virtual.pdf file properly by SPL2PDF SDK. You can use these products to create text based EMF-SPL file properly. I just used virtual printer for comparison and test purpose. In the real project, only physical printers used. 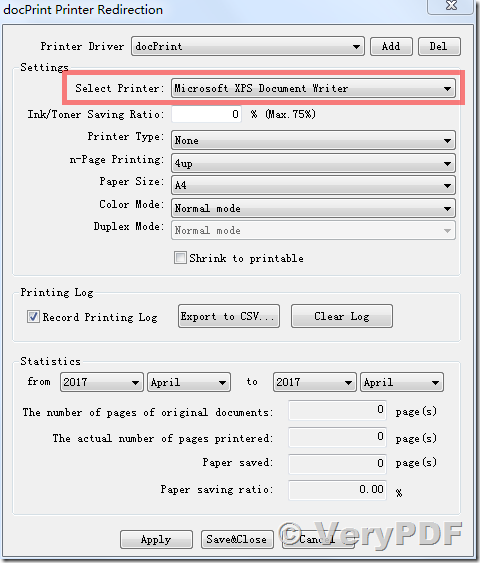 For the physical printer, can I get the pdf file (which is generated via spl file) similar to the one generated by virtual printer, so could get the text info easily? >>For the physical printer, can I get the pdf file (which is generated via spl file) similar to the one generated by virtual printer, so could get the text info easily? This matter is depend on your physical printer, the different physical printers will create different SPL file formats, we suggest you may use your real physical printer to test the final SPL format, so that you will able to find out the issues easily. 1.replace the physical printer driver with the virtual printer driver in our project's specific third party application config. 2. when printing, the virtual printer can generate the pdf with text info, which can be easily extracted. 3. use the virtual printer sdk, when the pdf saved, some callback function will be triggered, in the callback, i can add some logic to make the original real physical printer to print the same thing. Is the above possible? Thanks! >>1.replace the physical printer driver with the virtual printer driver in our project's specific third party application config. >>2. when printing, the virtual printer can generate the pdf with text info, which can be easily extracted. >>3. use the virtual printer sdk, when the pdf saved, some callback function will be triggered, in the callback, i can add some logic to make the original real physical printer to print the same thing. >>Is the above possible? Thanks! Yes, of course, above solution is possible, we have finished some similar projects for other customers in the past. We have several methods to "hook a physical printer" or "redirect print job from virtual printer to physical printer", we have also several software to finish these functions. Method 1. Use VeryPDF HookPrinter SDK to capture SPL files and use "SPL to PDF Converter Command Line" to convert from SPL files to PDF files. The generated PDFs' quality is depend on your physical printer. Method 2. Install docPrint Pro as a "dummy printer", connection between docPrint Pro and physical printer. Method 3. 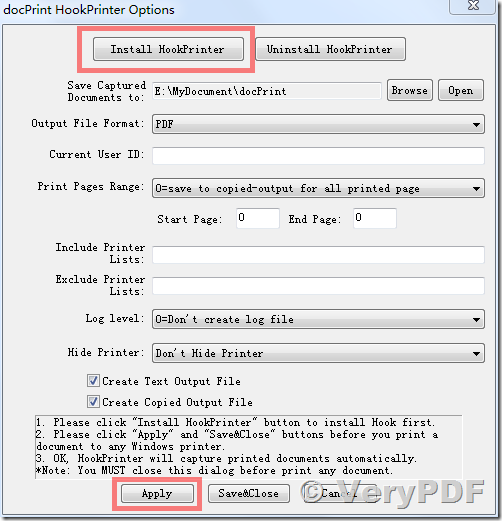 Install docPrint Pro as a "System-wide HookPrinter", use docPrint as a Printer Capturer. "-hookprinter" option will capture everything that you sent to any Windows Printer. Method 4. Print a document to docPrint or "docPrint PDF Driver" and save to a new PDF or image or other formats. In general, "-forward-options" option in docPrint Pro software is more simple and work better, the other options are complexity for end users. We suggest you may test above methods, if you encounter any problem, please feel free to let us know, we will assist you asap. How to convert files of AutoCAD to jpeg? This entry was posted in docPrint Pro, VeryPDF SDK & COM and tagged capture printer, forward printer, hook printer, printer capture, printer hook, virtual printer.. Bookmark the permalink.